mySociety has never run a campaign before today. 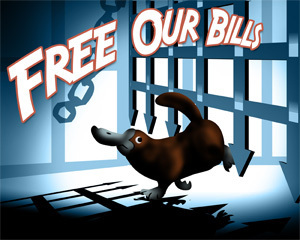 And we’re not sure anyone’s ever run a campaign featuring a charismatic duck-billed platypus escaping from under the closing jaws of a Parliamentary portcullis. Conservative Party leader David Cameron has just endorsed the campaign in a video. Now kind words from techy Lib Dem MP Lynne Featherstone. “Parliament belongs to the people. It’s time to open it up so people can find out what’s going on. mySociety has done a brilliant job in recent years in doing that – and it’s time to take this project to the next level and get information about the laws Parliament passes into the public domain. “It takes a new MP months to figure out how the tortuous bills procedures work – so how we expect the voters to know what’s going on, I have no idea. The changes MySociety are calling for are vital so that every MP is fully accountable for the decisions they take on behalf of their constituents. Best of luck. I tried to interest people in consulting on upcoming IT-oriented Bills from 2002-2005 on the PITCOM website (see “In Parliament” entries in the PITCOM archive.) Sadly, I have no evidence that anybody paid any attention. I console myself that I was ahead of my time. You guys are marketing the idea better, in a more comprehensive and user-friendly way, to, hopefully, a more receptive set of policy makers. I warn you that most so-called decision makers in the UK lack imagination, follow their own agendas without looking to left or right, and are risk-averse. (They are however very good at grumbling, after the event, if they don’t like the published Bills.) If you are to succeed, you must tap new sources for ideas. What are you doing about instigating proper scrutiny of legislation emanating from Brussels? MPs will have nothing to do when all our laws are being enacted by this undemocratic bunch of unelected foreigners who aspire to make our country their fiefdom. Someone must act for we British Subjects. I don’t think Cameron will without a strong push in the right direction. Publish the names of all Bills that are to be debated. Send papers to interested parties for scrutiny. Ensure that Civil Servants in the Departments are not included. TEACH COMMON SENSE IN SCHOOLS. Ugh- your boasting about an endorsement by Cameron makes me want to puke (not that ‘New Labour’ policies are anything but shameful). Associating myself with Conservative views goes entirely against my grain. The idea that Cameron’s lot has an interest in freedom requires a degree of naivete that denies rational analysis of what Conservatives stand for, now, previously and in their future pro-privelege outlook. If you are going to link to Cameron’s site, you could link to the specific video, not make us trawl through pages of ghastly Boris-endorsing hideousness to find the video in question! tom h – have updated the link to the YouTube video, thanks to Gareth for the link. Contrary to Hilda Meers’ outburst, it’s clear you’re not boasting about David Cameron’s endorsement but merely reporting it as fact; how this subverts her free will and causes her to associate herself with Conservative thinking escapes me entirely…if Cameron is the first party leader to publicly endorse a campaign which if successful will effectively make parliament more accountable to the people, does that tell us something about Conservative thinking? Great campaign guys – good luck! Hilda Meers, (assuming that isn’t a wonderful spoof comment) if you’re going to fight ‘privelege’ [sic] it would be a good start if you learnt how to spell it. Good ideas are good ideas, irrespective of whether or not David Cameron agrees with them. Whether you agree with him on other things or not, this is a great project, and having the support of the Leader of the Opposition (possibly the future PM) is a piece of good news for this project. Congratulations to all involved in securing his endorsement. when most people are off for the week-end or it is the last day of the Parliamentary Session. Taxpayer, are just wasting their time and their money, imagining that they support Democracy. And yet, how can you vote for a democratic system when the people you vote for are under the control of a bunch of Rubbish at Brussels. It is my opinion that the Thirty-one and a-half-million Taxpayers of the UK., should just abandon Westminster as the seat of government. As things stand today, every Taxpayer can simply change the way they work and are paid, so that the Employee and the Employer can Legally avoid Direct Taxation and the only Taxation that can be Legally enforced is the Local Council Tax. about this as it would be illegal for elected Councillors to be involved in any challenge to the authority of the Government. My vision, is of the Taxpayer in control of Taxation, County by County, then if you want to say no to the nonsense of wind turbines or eco-towns, it is your shout. Not some half-***ed politician who has listened to the words of the Brussels Politburo. Ellentétben a fit Hilda Meers “, egyértelm?, hogy nem flaunting jóváhagyásával David Cameron, hanem egyszer?, jelentések, hogyan kell aláásni és a szabad akarat teszi, hogy munkatársai magát a konzervatív elme me teljesen ingyen … Cameron, hogy az els? olyan pártvezér, hogy nyilvánosan támogassák a kampányt, hogy ha sikeres, hatékonyan parlament jobban elszámoltatható az embereknek, azt nem mondja el nekünk valamit konzervatív gondolat? I was listening to ‘Today in Parliament’ last night and I was gob-smacked that Conservative MP’s had to camp out overnight to ensure that their private members bills get on to the list. The public should be able to comment on bills and suggest their own worded amendments for the Lords & Commons to consider. Legal draughtsmanship is not always good and, on occasions, the pubic can do it better (well I certainly can). However no one listens to the public. Lets also abandon this silly and false pretence of “democracy”. Democracy only exists when there is full transparency and genuine accountability with national and local government. After all both ostensibly exist to server the public rather than to over-fill the pockets of those allegedly working for the public.